Massa Products Corp., introduces MassaSonic PulStar TTL Ultrasonic Sensors – your go to sensor when start‐up time, control, and low power matter most. 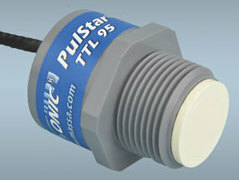 PulStar TTL is the newest addition to the MassaSonic PulStar Line of Ultrasonic Sensors. These mighty sensors deliver advanced user controls with low power – 5V DC. They communicate with the customer’s control system using asynchronous UART TTL signals operating at 1.8V levels. With a startup time of less than 500 msec., these sensors allow system integrators to develop optimal products with low power drain, which is particularly important when utilizing batteries. The PulStar TTL is UL, C1D1, and CE compliant in a properly integrated system! MassaSonic PulStar Plus combines élite transducer design, with newly developed software and firmware, in a tiny yet tough package. The IP 68 rated PulStar TTL operates over temperature ranges from ‐40°C to 70°C. Accurate measurements within 0.1% in the most rugged of environments over distances as close as 8 inches to 13 feet! Due to its ability to rule out false and unwanted echoes and give the user optimal power in operation, it’s ideal for use with variety of solids, chemicals, and fluids ‐ even when vapors are present. PulStar TTL is the finest choice for OEMs and Integrators ‐ it’s a versatile product that is ready to work with your project. Of course it’s all about quality in form, fit, and function, because the MassaSonic PulStar TTL is designed and manufactured in the USA by the Innovative team at Massa Products Corporation. With 70+ years of experience, the development of modern sonar and ultrasonic transducers and systems, and over 165 U.S. Patents, Massa delivers the ultimate quality in design and performance. Custom tailored modifications when applicable. Massa is family owned and operated, so you know that the care they give to all aspects of the business, from products to services, is personal. Visit the Massa Website to learn about their business, their innovative products, and the MassaSonic PulStar TTL Sensor www.massa.com.